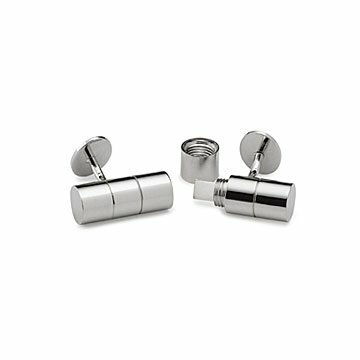 Gear up undercover agent style with these cufflinks that have a hidden message inside. Every undercover agent knows: the secret to completing missions is all in the gear. This brass cufflink set looks like a traditional pair, but unscrew them to find tiny strips of paper. What you write on them is classified: a message from your partner, a positive intention for the week, or notes for your next covert mission. They make a unique gift for loved ones with a healthy imagination, because there's no shame in a James Bond daydream now and then. Made in China. Wipe down gently with soft cloth. A wonderful unique anniversary gift! I was looking for an unusual anniversary gift and this was just perfect.